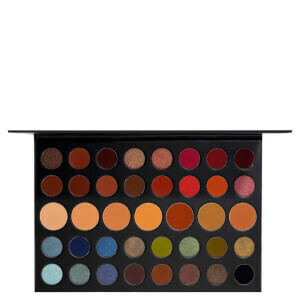 Create endless eye makeup looks with The Jaclyn Hill Eyeshadow Palette from Morphe. Developed in collaboration with American YouTuber, Jaclyn Hill, the palette combines 35 shades of pressed powder in a range of matte and shimmer finishes. Blending seamlessly onto the lids for smooth, even application, each buildable eyeshadow delivers long-wearing, high-pigmented colour with superior payoff. The palette offers bright, daring hues and warm, neutral undertones that allow you to achieve a variety of results to suit any outfit or occasion. Can be worn alone or layered for customised colour. Row 1: Enlight, Beam, Silk Crème, M.F.E.O., Faint, Sissy, Little Lady. Row 2: Creamsicle, Butter, Pooter, Pukey, Hunts, Firework, Queen. Row 3: Obsessed, S.B.N., Hillster, Roxanne, Jacz, Buns, Cranapple. Row 4: Royalty, Twerk, Hustle, Meeks, 24/7, Chip, Mocha. Row 5: Pool Party, Jada, Diva, Enchanted, Central Park, Soda Pop, Abyss. Apply alone or blend together for customised colour. Talc, Mica, Kaolin, Dimethicone, Tridecyl Trimellitate, Phenyl Trimethicone, Ethylhexyl Palmitate, Octyldodecyl Stearoyl Stearate, Capryl Glycol, Phenoxyethanol, Ethylhexylglycerin. May contain: Isononyl Isononanoate, Isostearyl Isostearate, Nylon-12, Polymethylsilsesquioxane, Magnesium Stearate, Silica, Titanium Dioxide (CI77891), Iron Oxide Black (CI77499), Iron Oxide Yellow (CI77492), Iron Oxide Red (CI77491), Hydrated Chromium Oxide Green (CI77289), Ultramarine Blue (CI77007), Ferric Ferrocyanide (CI77510), Chromium Oxide Greens (CI77288), Manganese Violet (CI77742), FD&C Red 40 AI Lake (CI16035), FD&C Yellow 5 AI Lake (CI19140), FD&C Blue 1 AI Lake (CI42090). Save 20% on selected Morphe. Discount has been applied to the RRP. Offer valid for a limited time only. I had heard a lot of good things about Morphe and their palettes. I could never find one that I absolutely loved until I came across this one! The shades are PIGMENTED and honestly this palette is the only thing I reach for anymore! Would highly recommend to anyone! I finally got my hands on the Jaclyn Hill palette after sooo long and it is beautiful! This eyeshadow palette is worth every penny. The colours are very pigmented and a little goes a long way. There is a great selection of colours including a nice mix of mattes and shimmers. The colour lasts on my eyelid easily for 8 hours (with a little help of setting spray). I find it easiest to apply the shimmer colours with my finger rather than a brush as the colour pay off is much better. The mattes are easy to blend and you can create some really great looks! 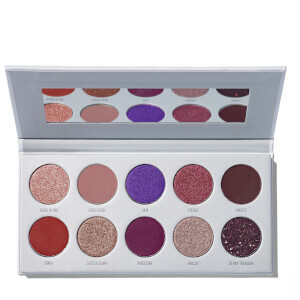 This pallette is so fun and creqtive, the colours and formula are just such a high quality. Very easy to blend and are super pigmented. Love this! !